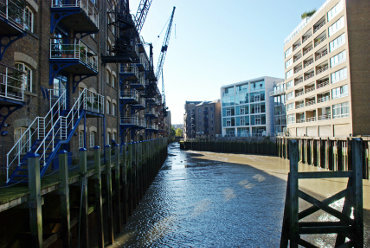 Walking to the eastern end of Shad Thames and thence to the edge of the Thames will bring you to New Concordia Wharf where a number of the old dock warehouses have been converted to (expensive) apartments. 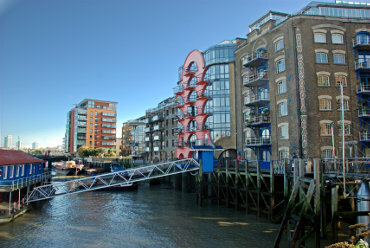 St. Saviour's Dock is one of the old docks now surrounded by old warehouses converted to expensive apartments. To cross from the Tower Bridge side use the obvious footbridge from which this photograph was taken. Walking east along Bermondsey Wall West, and onwards, will give you access to the riverside where you will see views like this. 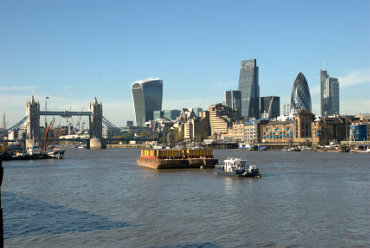 Tower Bridge is plainly visible together with some of the tall buildings in the City of London. 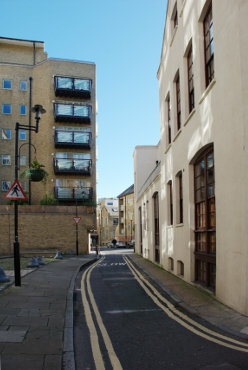 This view along Bermondsey Wall West gives an idea of the narrow streets in this part of London.